Learning to enjoy your vacation is possible! Summer is here! Long days… and, of course, vacation! We look forward to summer vacation to relax, unplug, and simply enjoy ourselves. 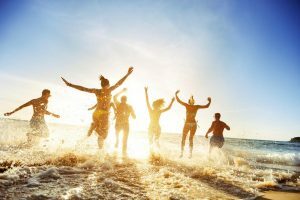 Research shows how important vacation time is mentally, as well as emotionally and physically. Vacation provides the opportunity to de-stress from the burdens of our daily lives, whether it be work, school, or family commitments. We count down the days, and as it gets closer to time away, we eagerly cross our remaining ‘to do’s’ off the list. We spend so much time anticipating, preparing, and in no time, vacation is over. Time flies when we are having fun! Personalize your world. When displaying or looking through souvenirs and mementos from the trip, make sure they are personal and evoke specific memories. Mindfully using your mementos, researchers say, can prolong your holiday bliss. Before you hang a map of Italy to capture your stay in Rome, stop to consider what exactly you want to remember about your trip, says Barry Gordon, director of the Memory Clinic at Johns Hopkins University and author of Memory: Remembering and Forgetting in Everyday Life. If we want to hang a picture, experts suggest using a photo you took, rather than a professional one. This way when viewed, it will serve as a stronger reminder of the experiences when the photo was taken and reminiscing will bring it to the present. Mind over memories. Having control over when and how we access our memories can have a huge impact on how they affect us post-vacation. For example, seeing a photo of a luau in your laundry room might have a negative effect… making your everyday life pale in comparison to the memory…, says Jason Leboe, University of Manitoba in Canada. Set aside time to go through pictures and mementos from your vacation when you can truly sit and savor the memories.Having a cue where you’ll have time to relive and elaborate on the moment will strengthen the memory over time. Relive, remind. Another way to memorialize your trip is “behavioral reenactment, or trying to reconstruct physically and in the environment the same things that you were experiencing when you were on the vacation,” suggests Fred Bryant, author of Savoring: A New Model of Positive Experience. If you enjoyed your hotel room in Hawaii, give your bedroom a makeover by finding similar curtains or the same bedspread, and hanging the same etchings by the door. Use shells or souvenirs you actually acquired on your vacation to evoke the feeling of being back on vacation. Although vacations may come and go, be sure to use the experiences to their full advantage and retain the benefits for as long as possible. This entry was posted on Tuesday, June 27th, 2017 at 1:09 pm. Both comments and pings are currently closed.